I thought I'd read this already. I have a vivid memory of me, five or six years ago, picking up a beautiful cloth-bound edition in the library. That's all I remember, and so I assumed I'd gone ahead and read it. But I guess not, because now I realise there's no way I could ever forget such a poignant, beautiful, heartbreaking novel. Lennie was always a step behind her sister. Bailey was the outgoing one, the extraordinary one, the one with all the confidence and big dreams. Lennie was quieter. But then, when Bailey dies, Lennie is thrust into the spotlight, and the only person who seems to understand her grief is Toby, Bailey's boyfriend. And then they kiss, and not just once. But Toby's not the only boy in Lennie's life. There's Joe Fontaine, the new boy from France, who, moment by moment, injects happiness back into Lennie's family and shows her how to live again. 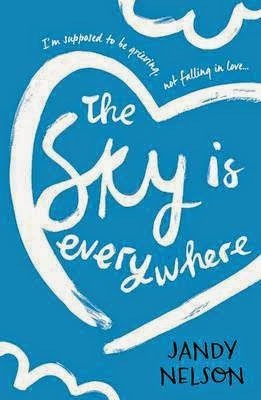 The Sky is Everywhere is one of those books full of beautiful, enchanting quotes that make you want to write them all over everything, Lennie-style. Right now, I'd rather be doing that than writing this review because I just don't know what to say. It's an extraordinary book, and how can you put that into words? What I can say is that it dealt with grief well - very, very well - and, if you're like me and you wanted to pick this up already but never got around to it, drop everything and get a copy. It's worth every single penny in the world. If I ever write a book, which I hope I do (I'm almost done with a first draft!) I can only hope it'll be half as good as this. Earlier this year I teamed up with Walker on a secret book fairy mission. They kindly sent me five extra copies of The Sky is Everywhere, as well as mini sketchbooks to promote Jandy Nelson's new book, I'll Give You the Sun, and my challenge was to drop them in random places for people to pick up, take home, and read. I vlogged, and you can watch me stealthily dropping the books and spying on the people who took them, here. Enjoy! I adored I'll Give You the Sun, so it's no surprise to me that The Sky is Everywhere was beautifully written. I definitely need to read this one too. alskjdhbfbnsasdjhfbnaksjdhfbb ONE OF MY FAVE BOOKS EVER YOU FINALLY READ IT IS YOUR HEART SUFFICIENTLY HURTING FROM THE BEAUTIFUL AMAZING STUNNING-NESS OF THIS BOOK? and yes. hashtag writing goals. wow my comments clearly reflect my intelligence and sophistication.. THIS IS ONE OF MY FAVORITE BOOKS EVER. I read this back when I was 13 and I fell completely in love with it.